B Martin, W Zakhary, P Visintainer, P St.Marie, K McGrath, T Pham, A Wilkens, T Ungerer. The Effect Of Local Anesthetic Boluses On Post-Op Opioid Consumption After Adductor Canal Blockade In Total Knee Arthroplasty Patients. The Internet Journal of Anesthesiology. 2018 Volume 37 Number 1. Methods: To determine if a larger volume of local anesthetic solution, administered via an adductor canal catheter, can reduce opioid consumption, we conducted a retrospective chart review of patients undergoing total knee arthroplasty. A review of 130 patient charts found 87 that were eligible for study. Results: multivariable analyses suggested that for each 10 ml increase in total bupivacaine volume, post-op opioid use decreased by 1.33 mg morphine equivalents (95% CI: - 2.76, 0.10; p = 0.069), adjusting for age, gender, BMI, and catheter depth. For post-op pain scores, only gender and age were statistically significant in multivariable analysis. In univariable and multivariable analyses, catheter depth was not associated with either outcome. Conclusion: Increasing local anesthetic volume utilizing an adductor canal catheter, resulted in reduced opioid consumption in patients undergoing total knee arthroplasty. This was a retrospective chart review. We reviewed the charts of 130 adult patients who underwent total knee replacement, from September through December of 2015. 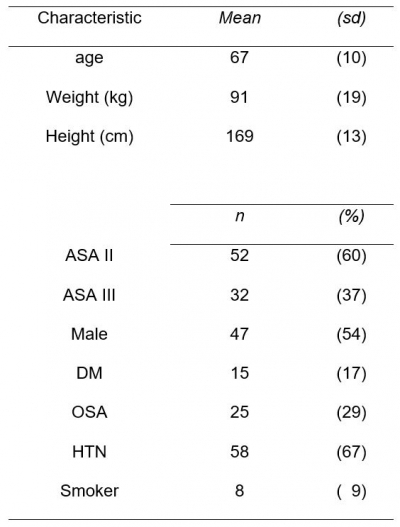 We included adult patients with ASA classification I-III age 18 years or older, who received an adductor canal catheter for knee replacement surgery. 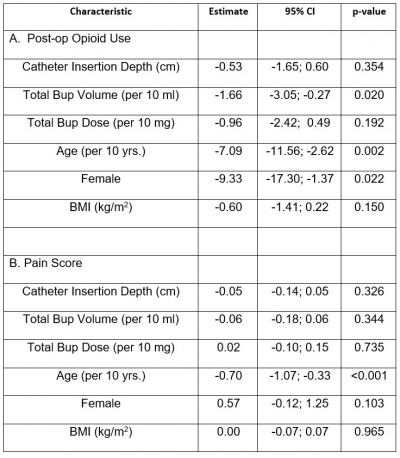 We captured demographic data, intraoperative and postoperative opioid use, pain scores, type and volume of local anesthetic solution administered and depth of the adductor canal catheter. Exclusion criteria included chronic pain patients (patients consuming opioids for greater than 3 months), patients requiring post-operative catheter replacement due to block failure or dislodgment, patients who received intravenous ketamine and patients who received peri-neural dexamethasone or any other additives such as epinephrine. All patients received an adductor canal block via a needle injection. This was followed by placement of a nerve catheter in the adductor canal, which was performed in the pre-anesthesia unit. The adductor canal blocks were performed with ultrasound guidance, and with the use of an 18-gauge tuohy epidural needle. All eight providers used different volumes of local anesthetic boluses after the placement of the adductor canal catheter. They also threaded the catheter to varying depths in the adductor canal. All providers placed the B. Braun, 20 gauge, 40-inch polyamide epidural type catheter, at the distal portion of the proximal 1/3 of the thigh, to avoid encroachment on the surgical field. In terms of opioids, patients received oral and intravenous opioids prior to surgery and were administered oral and intravenous opioid boluses and patient controlled analgesia infusions containing hydromorphone, after the surgery. As Patients also received non-opioid analgesics, which included acetaminophen and celecoxib. After completion of the surgical procedure, anesthesia end time was noted as the time the patient was transported to the post anesthesia care unit. Shortly after arrival in the post-anesthesia care unit, a bupivacaine peri-neural infusion began at 10 ml/hr for all patients and continued until the morning of post-operative day 2. In other words, all patients received the same hourly volume and concentration of bupivacaine (0.1%) via an infusion pump for roughly the same duration. Therefore, the bupivacaine infusion volume was not part of the analysis. The primary outcomes were the effect of local anesthetic boluses and adductor canal catheter depth on post-operative opioid consumption and pain scores. All opioids were converted to morphine equivalents. Providers used two different concentrations of bupivacaine; 0.125% and 0.25%. The distributional assumptions of all variables were examined. Means and standard deviations were computed for continuous measures and frequency distributions for categorical variables. To adjust for patient and other clinical characteristics that may influence outcomes, linear regression was used for analysis for both outcomes: opioid use (reported as mg morphine equivalents) and post-op pain scores. In these models, the estimates of the catheter depth and bupivacaine boluses were adjusted for patient characteristics of age, gender, and BMI. Estimates from the multivariable procedures were reported with 95% confidence intervals. Significance testing was conducted at a critical level of 5%. Data were analyzed using R, version 3.4 (R Core Team, 2017). Sample size estimation. Sample size was based on the correlation between two continuously-scaled variables. A sample of 87 patients would provide at least 80% power to detect a correlation of 0.30 or greater as significant at a critical level of 5%. In simple linear regression, this is equivalent to an R2 value of 0.09. In multiple linear regression, a sample of 87 patients would at least 85% power to detect an R2 value of 0.10 due to two independent predictors (i.e., catheter depth and total bupivacaine volume), controlling for at least three potential confounding factors. Sample size estimates were conducted using Power and Sample Size (PASS, version 13, Kaysville, UT). We did not include data on motor function, muscle weakness, ambulation distance or post block sensory assessment, as these parameters were not consistently recorded in the medical record. The patients of one surgeon were included in this review. Our sample consisted of 87 patients, after screening 130 charts, during the time period of September to December of 2015. Forty-three patients were excluded due to incomplete data. 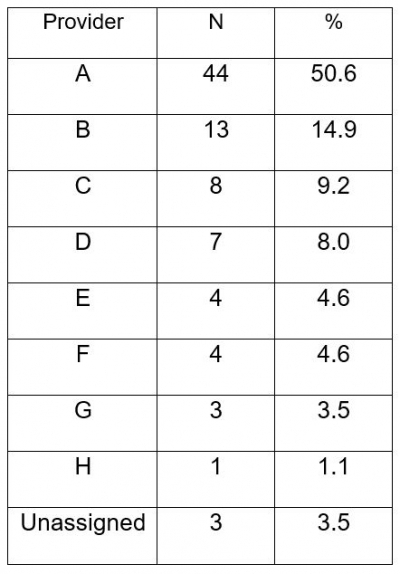 Table 1 provides the demographic data and comorbid conditions for the sample of 87 patients. The average age of patients in the sample was 67 years with a range of 45-86 years of age. The average height and weight of the patients were 169 cm and 91 kg respectively. The range of weights was 58 kg to 134 kg. The range of heights was 140-193 cm. More than half the patients were male, had hypertension and were ASA class II. Eight different anesthesia providers placed adductor canal catheters, with one provider placing a majority of the catheters (44 catheters placed or 52.4%, table 3). The average adductor canal catheter depth was 17 cm. The average bupivacaine dose was 88 mg and the average bupivacaine volume was 59 ml. The average opioid dose was 38 mg and the average pain score from 20-24 hours post anesthesia care was 3/10. After simple (unadjusted) regression was performed (table 4), total bupivacaine volume led to a reduction in total opioid usage. For every 10 ml of bupivacaine administered, opioid consumption decreased by an average of 1.7 mg of morphine equivalents (95% CI: -3.05 to --.27; p= 0.02). Patient characteristics of age and gender (female) were also significantly associated with post-op opioid use. For each 10-year increase in age, post-op opioid use decreased by 7.09 mg morphine equivalents (95%CI: -11.56, -2.62; p = 0.002). Females used about 9.3 mg morphine equivalents less post-op opioids than males (95% CI: -17.3, -1.37; p = 0.022). For unadjusted estimates for pain scores (table 4), the only characteristic that emerged as significant was age. For each 10 year interval in increasing age, reported pain scores decreased 0.70 (95%CI: -1.07, -0.33; p < 0.001). Catheter depth did not appear to lead to a significant reduction in opioid consumption. There was no significant reduction in opioid consumption or pain scores with increased bupivacaine dose. As shown in table 5, multivariable analyses suggested that for each 10 ml increase in total bupivacaine volume, post-op opioid use decreased by 1.33 mg morphine equivalents (95% CI: - 2.76, 0.10; p = 0.069), adjusting for the other factors in the model. Increasing age remained associated with decreased opioid use. For each 10-year increase in age, post-op opioid use decreased by 7.99 mg morphine equivalents (95% CI: -1 2.32, -3.66; p < 0.001). Females tended to use less post-op opioids than males by 7.38 mg morphine equivalents (95% CI: - 15.14, 0.39; p = 0.062). 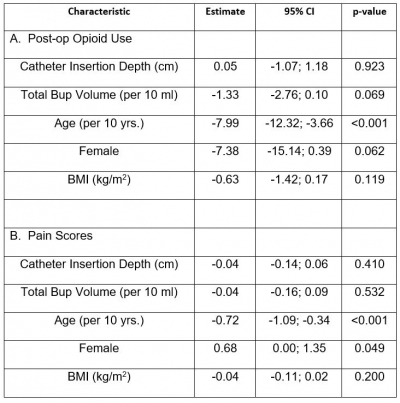 Catheter insertion depth did not appear to influence post-op opioid use. Multivariable analysis of pain scores indicated that only age and female gender were associated with reported pain. Neither catheter insertion depth nor total bupivacaine volume appeared associated with reported pain scores. No patient-falls were noted in the charts screened. In theory, a fraction of the local anesthetic injected in the adductor canal may exit the adductor hiatus and can anesthetize the popliteal plexus: a collection of nerves contributed by the tibial and obturator nerves, attached to the popliteal vessels.1 This plexus of nerves provides innervation to the posterior knee and articular surface of the knee joint. Prospective randomized controlled studies would have to be conducted to support this theory. These studies should probably include imaging modalities and dyes to ascertain the spread of the local anesthetic in vivo. The typical incision for a total knee arthroplasty is a midline incision, extending from above the patella to just below the knee joint.7 The innervation along this incision knee arthroplasty is derived from cutaneous femoral nerves and the saphenous nerve.8 The midline incision’s location is typically in the anatomical region supplied by these nerves. Other sources of pain include posterior knee pain include regions of the knee innervated by the sciatic and obturator nerves.1 Blockade of the saphenous nerve alone will not provide complete analgesia. The patients in this study were provided with intravenous hydromorphone via patient controlled analgesia (PCA), and oral analgesics to address the other sources of pain as mentioned above. The average pain score in this study was 3/10. It is possible that the opioid reduction and the low pain scores in this study were a result of spread of local anesthetic to some of the anatomic locations not supplied by the saphenous nerve. This theory will have to be validated in future studies. Adductor canal catheters have been shown to be similar in efficacy with regards to analgesia, when compared to femoral nerve catheters.9 A benefit of adductor canal catheters is the lack motor blockade, often present with femoral nerve catheters.9 The lack of motor blockade is an important factor for ambulation, as demonstrated in previous studies.9 In this study, we were able to demonstrate a statistically significant reduction in opioid consumption with increasing local anesthetic volume. As the local anesthetic bolus volume increased, patients consumed less opioid. At the time of the study, we were unaware of other studies examining the effect of increased volume of local anesthetic on analgesia in patients undergoing total knee arthroplasty. Another strength of the study is the lack of local anesthetic toxicity events, possibly reassuring anesthesia providers contemplating administering increased volumes when placing adductor canal catheters. The safety of increased local anesthetic volume and dose was not the focus of this study, and was not analyzed. Therefore, this aspect would need to be evaluated. One limitation is the design of this study: a retrospective chart review without a control group. Randomized controlled trials may have to be conducted to support the findings of this study. Secondly, we were not able to examine knee strength as done in previous studies,9 as the data was not consistently available. This is a concern as a number of studies have shown that the local anesthetic can also spread proximally to the femoral triangle, leading to femoral nerve blockade and a resultant motor block. There were no falls reported in this study. Although the lack of patient falls does not equate to lack of motor blockade.9 A motor block of the lower extremity will also preclude participation in physical therapy. We did not separate the patients based on the concentrations of bupivacaine used, as the there was no significant difference with regards to opioid consumption or pain scores. Another limitation of the study is the number of anesthesia providers placing the adductor canal catheters; a total of eight. Variations in technique may have negatively affected the results. However, despite the number of providers, we were still able to demonstrate a significant reduction in opioid use. The number of providers may be consistent with the number of providers in similar practices. This may be viewed as a potential strength of the study. We were not able to report a sensory an assessment of the adductor canal block, as this was not reported in the medical record. Lastly, we did not include an analysis of non-opioid analgesics in this study, as they were not consistently administered. These analgesics may have affected the results. When larger volumes of bupivacaine were administered through an adductor canal catheter to patients who underwent a total knee arthroplasty, there was a significant reduction in opioid consumption, as bupivacaine volume increased. Female gender and age were also associated with significant reduction in opioid consumption and pain scores. The authors thank Joanne Montgomery BSN and Anne-Marie Begley (Dept. of anesthesiology at Baystate Medical Center) for their efforts in managing administrative items. 1. Andersen HL, Andersen SL, Tranum-Jensen J. The spread of injectate during saphenous nerve block at the adductor canal: a cadaver study. Acta Anesth Scand. 2015;59:238-245. 2. Runge C, Moriggl B, Børglum J. The spread of ultrasound-guided injectate from the adductor canal to the genicular branch of the posterior obturator nerve and the popliteal plexus. Reg Anesth Pain Med. 2017;42(6):725-730. 3. Seo SS, Kim OG, Seo JH. Comparison of the Effect of Continuous Femoral Nerve Block and Adductor Canal Block after Primary Total Knee Arthroplasty. Clin Orthop Surg. 2017;9(3):303-309. 4. Hanson NA, Allen CJ, Hostetter LS. Continuous ultrasound-guided adductor canal block for total knee arthroplasty: a randomized, double-blind trial. Anesth Analg 2014;118:1370-7. 5. Li D, Yang Z, Xie X. Adductor canal blocks provide better performance after total knee arthroplasty compared with femoral nerve block: a systemic review and metaanalysis. Int Orthop. 2015;40(5):925-33. 6. Yuan SC, Hanson NA, Auyong DB. Fluoroscopic Evaluation of Contrast Distribution Within the Adductor Canal. Reg Anesth Pain Med 2015;40(2):154-157. 7. Vaishya R, Vijay V, Demesugh DM. Surgical approaches for total knee arthroplasty. J of Clin Orthop Trauma. 2016;7(2):71-79. 9. Kim D, Yin L, Goytizolo EA. Adductor canal block versus femoral nerve block for total knee arthroplasty. Anesth 2014;120:540-550. University of Massachusetts Medical School. Department of Anesthesiology. Baystate Medical Center.